Not only is this dish a display of beautiful colors, but it’s also extremely nutrient-dense. 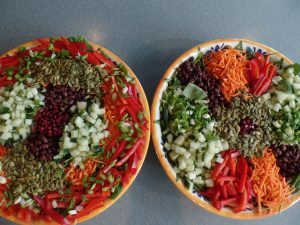 This salad has everything from cucumbers to carrots, peppers to pomegranates, and seeds to scallions. And yes, I case you were wondering, those are black beans. So, what exactly is an antioxidant? An antioxidant is a substance that removes potentially damaging oxidizing agents in a living organism. Oxidation is a chemical reaction that can produce free radicals. This can lead to chain reactions that may damage cells. That’s why it’s so important to get your fair share of antioxidants from your food. Romaine Lettuce: vitamin A, B vitamins, vitamin K, magnesium, manganese, phosphorus, and potassium. Spinach Leaves: iron, vitamins A, C, and K, vitamins B1 and B6, magnesium, manganese, and potassium. Black Beans: fiber, protein, vitamin A, calcium, iron, copper, phosphorus, and manganese. Cucumbers: fiber, potassium, vitamins A, C and K.
Carrots: beta-carotene, vitamins A and C, copper, calcium, potassium, manganese, phosphorus, folic acid, and fiber. Red Bell Peppers: fiber, vitamins A, B6, and C, iron, copper, zinc, potassium, magnesium, manganese, and selenium. Pomegranate Seeds: fiber, vitamins C and K, calcium, copper, potassium, and magnesium. Pumpkin Seeds: magnesium, manganese, B vitamins, vitamin E, copper, potassium, calcium, iron, selenium, and zinc. Scallions (Green Onions): fiber, manganese, potassium, vitamins A, B6, C and K, and copper. 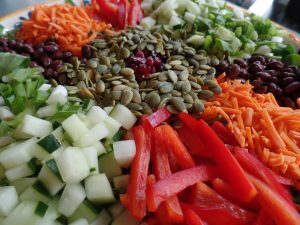 Now you know why this colorful display of vegetables, legumes, and seeds has been named the Antioxidant Salad. Click on the link below and follow this delicious yet nutritious recipe to “Eat the Rainbow” and all the antioxidants your body needs and loves!